With the arrival of the good weather, we all want to go out on the street and enjoy the sunshine and there is no better place to do it than in one of the wonderful parks you can find in the Spanish capital. Would you like to know more about them? Carry on reading. Over 56 acres in size, this is one of the most beautiful green spaces in the whole region of Madrid, located just 30 minutes away by car from our hotel. The best thing about this park is that we can see replicas of some of Europe’s most emblematic monuments without leaving the city, from the Trevi Fountain to the Eiffel Tower and even the Brandenburg Gate. The park also has many different lakes and canals, among them a large main lake of over 161,000 ft2 where you can go rowing. Just head over to the dock, rent a boat and enjoy a great time with your family or partner. This is, without doubt, the ideal place to come to for a pleasant day out with children thanks to the many play areas and the multi-adventure space with zip lines and archery inside. This is undoubtedly the most popular park in Madrid. El Retiro is 333 acres in size and home to over 15,000 trees. When you visit it, you must stop and see La Rosaleda (the rose garden, best to visit it in May when the flowers are blooming); the Crystal Palace, a pavilion which back in the day hosted an exhibition of exotic plants as part of the Philippines’ Exhibition for the World’s Fair and which is now an exhibition room; and Velázquez Palace, which is also an exhibition centre now. To top off the visit, there is nothing better than enjoying a boat ride on the Large Lake or some of the many activities organised for children. Madrid’s most unknown and romantic park is located in Alameda de Osuna, created in 1784 by the Dukes of Osuna. El Capricho has spaces of great botanical wealth among which there is a labyrinth designed for lovers to play and hide in. Inside you can also find three different garden types: parterre or French garden, the English landscape and the Italian giardino. Located in the new district of Valdebebas, this is the ideal park for the whole family. It has three metal slides, a line of vertical wooden tree trunks and a recreational area with ropes. However, the most impressive feature of this park is the double zip line of 50 yards in length. We finish the list with a green space integrated in the city, with over 6 miles in length which go from El Pardo to Getafe. Madrid Río is the perfect park for runners, cyclists and visitors who wish to enjoy a quiet stroll surrounded by trees. It is also perfect for children, since it has over 10 children’s play areas. 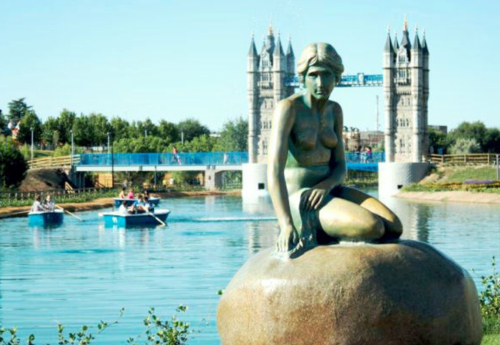 However, its main distinguishing feature is its urban beach, which includes three aquatic areas, a fantastic option for the hot summer days in Madrid. The park also has five green spaces with different activities for families, couples and sportsmen and women. Which one will you visit first?